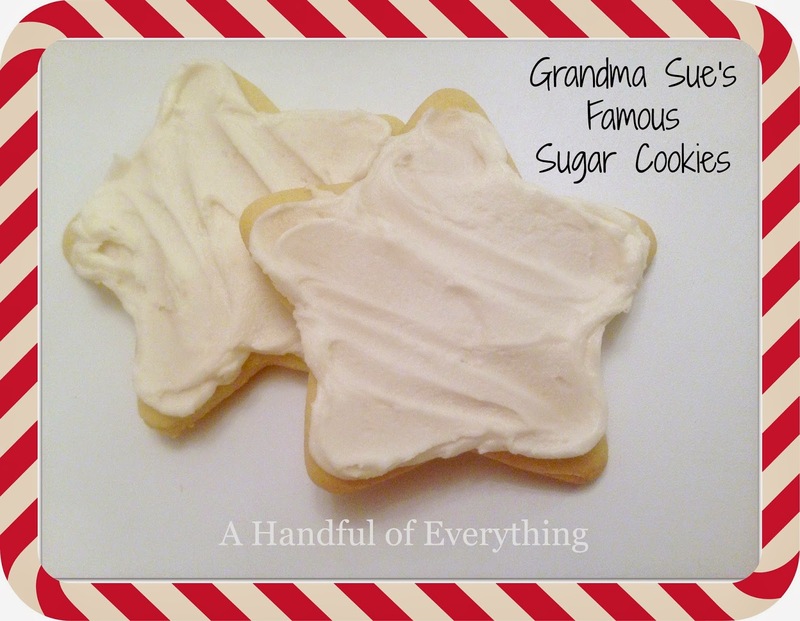 Grandma Sue's famous Sugar Cookies! Good morning! It's Krista again from A Handful of Everything. Today I am sharing with you one of my family's absolute favorite recipes. This is yet another fabulous recipe given to me by my Mother-in-law Sue. My kids love these cookies and we make them several times a year but they are a tradition to make every Christmas. These soft and fluffy old fashioned cookies are so good you can't just eat one. These are great sprinkled with colored sugars or my favorite homemade buttercream frosting! Regardless what you put on top of these they are sure to please. To get the recipe for these delicious Sugar Cookies just click here! To receive our free recipes & tips follow us through our social medias, or by email! Follow A Handful of Everything's board Bloggy Christmas 2014 on Pinterest. Follow A Handful of Everything's board Baker's Dozen Christmas Cookie Exchange 2014 on Pinterest.